The ASPET Annual Meeting is where pharmacology meets experimental biology in ONE community. Join 1600 scientists passionate about pharmacology as ASPET intersects with over 10,000 other experimental biologists in physiology, biochemistry, molecular biology, pathology, and anatomy. 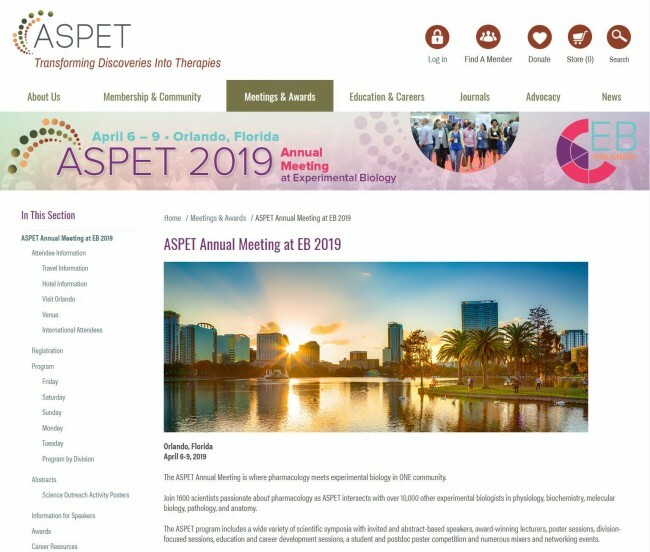 The ASPET program includes a wide variety of scientific symposia with invited and abstract-based speakers, award-winning lecturers, poster sessions, division-focused sessions, education and career development sessions, a student and postdoc poster competition and numerous mixers and networking events.